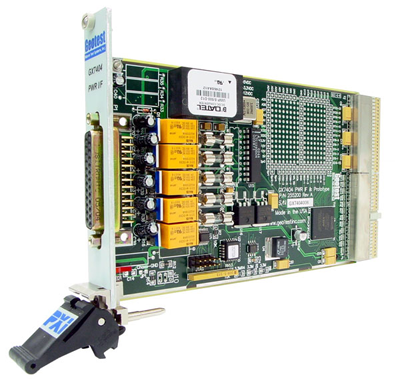 The GX7404 power interface board offers a low cost method for providing controlled power to UUT interface and test circuitry. The GX7404 provides +5 V, +3.3 V, +12 V, and -12 V voltage outputs which are present on the PXI motherboard to be switched through a DB25 connector for use by a UUT (unit under test) and / or interface circuitry. The GX7404 is configured with four relays that switch voltages to the DB25 inteface connector. Each voltage is fused and an optional UUT discharge component may be added. In addition, the GX7404 has special features, including external inhibit, UUT discharge, and a prototype area. The external inhibit is a TTL compatible input that removes all voltages from GX7404's outputs. The prototype area of the board can be populated with UUT discharge components. Each of the four relays on the board can switch the UUT load between the GX7404 outputs and the discharge components. The GX7404 provides an 13 row by 15 column prototype area on 100 mil centers. Power rails are present in the prototype area. The GX7404 is supplied with the GXPXI software package which includes a virtual instrument panel, a Windows 32/64-bit DLL driver libraries and documentation. The virtual panel can be used to interactively program and control the instrument from a window that displays the instrument’s current settings and status. In addition, interface files are provided to support access to programming tools and languages such as ATEasy, LabView, LabView/Real-Time, C/C++, Microsoft Visual Basic®, Delphi, and Pascal. An On-Line help file and PDF User's Guide provides documentation that includes instructions for installing, using and programming the board. A separate software package - GtLinux - provides support for Linux 32/64 operating systems.